Looking for a USED STA-50? 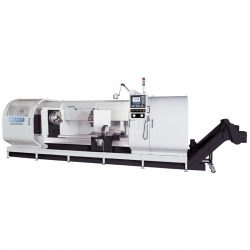 This is a high precision CNC flat bed lathe with FANUC Oi-TD control. The STA series is available with option of 6", 9", 12" or 15" spindle bore, 37.38" swing over bed and 59" to 236" distance between centers. The bed width is 24" and the spindle motor is available up to 29 HP. Looking to Purchase a New SHARP STA-50?